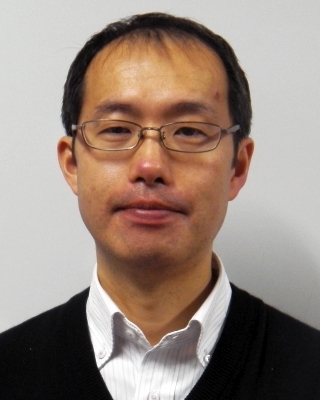 Horiguchi's research interest is on human factors, human-machine interaction, and interface designs leading to coordinated joint activities between human and machine intelligences. The research projects he is working and has worked on in recent years are summarized as follows. Sonification is a kind of techniques to convey data relations that are originally not perceivable to humans by converting it to non-voice, acoustic signals. While many studies have been done around it mainly by western researchers since 1990s, no solid guidelines have been established regarding how to design mappings from data to sound. This research project aims to study theories of designing effective sonification to acoustically represent the state of controlled systems that changes from moment to moment. We have been coducting empirical studies that examine various data-to-sound mappings by experiments in order to find principles of sonification design considering properties of variables and their relations to be represented by artificial sounds. The studies conducted so far revealed several points of effective sonification design including what type of tasks is preferred to be supported by sonifications to visual displays, such as: (1) differentiating pitches is the most effective way to represent multiple state variables by synthesized auditory tones, (2) Frequency Modulation is a promising way to generate changes in the sound timbre to communicate nominal information of quantities such as identity and sign of variable, and (3) sonification is suitable for supporting search tasks in which the maximum/minimum point of a particular function is sought for because acoustic search tasks impose less amount of cognitive workload than visual ones, thus giving a good option to distribute multiple task processing demands across modalities. For the purpose of developing a practical support tool for human workers engaged in industrial robot teaching, this research project is developing a user interface to provide effective information supports for various granularities of the activity to teach operation positions to the robots. At this moment, position teaching works were analyzed by use of a mechanical explanation model to capture the force-displacement relationship inherent in the work system, and it clarified a rational strategy to make use of an invariant frame of reference in the position search space. Based on the analysis, a prototype interface was developed that represents the activity-related information in a way that enables the robot operators’ strategic and efficient operations. 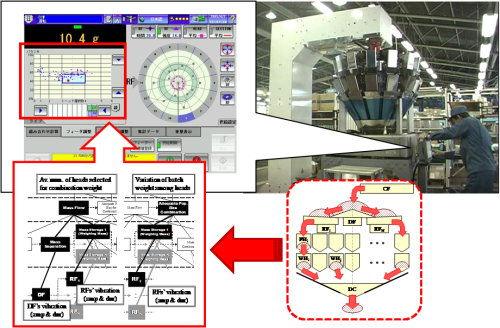 In this project, a smart user interface was developed to support human workers engaged in conditioning a factory automation system――computer-controlled multihead weighers (CCWs). CCWs are automated weighing machines which can produce merchandise products accurately within a specified weight range and at high speed, but they are complex mechanical systems with a lot of parameters to be configured in response to process conditions. The inherent functional structure of CCW was clarified in terms of means-end relations, and such relations were visualized onto the control panel to encourage human operators’ “direct perception” of meanings or values of their practicable actions to the automated processes. The developed user interface can facilitate unskilled operators appropriately evaluating and effectively responding to their immediate work situations. In this research project, communicative breakdowns in menu-based human-computer interactions were investigated in terms of “information scent” distributed among menu items. Pirolli et al.’s information scent model, which employs a text mining technique to calculate scent measures, is extended to analyze the value of each menu item when the user tries to access a particular function of the computerized system. In this model, a scent measure estimates the extent to which an individual option attracts the user’s attention with respect to his/her specific goal. Comparative experiments confirmed that the users’ search in the menu hierarchy tended to fail when menu options competing to the correct ones were designed to have stronger scents toward the goal. Menus should be designed to be compatible with the users’ naturalistic decision strategy, and the information scent model can provides valuable (predictive) information on their menu selection behaviors. Automated systems are often structured into modes for providing enhanced capabilities to deal with various task conditions. However, it requires the users to maintain their awareness of the system modes, otherwise mode errors and then automation surprises may be induced. Salient feedback on the mode status is necessary for correct mode awareness, but it should be carefully designed not to interfere in the user’s primary task to be achieved in collaboration with such systems. This study focuses on action-effect relations as an intuitive user-automation communication channel that can provide additional and valuable information on the system mode, where an action-effect relation is defined as an association of a user action with some observable effects on the system behavior. Through driving simulator experiments, drivers’ awareness of the operating mode status of ACC (Adaptive Cruise Control) was examined to confirm that different modes with a similar configuration of action-effect relations should be easily mixed up with one another during driving with the mode-rich automated system.